Founded by St. Vincent de Paul in 1617, the Ladies of Charity responded to the needs of the poor in 17th-century France. Together with St. Louise de Mariliac, they went quietly about their tasks, seeking no recognition, satisfied with the knowledge that they were serving Christ in the person of the poor. The Ladies of Charity, since their origin, have possessed the charism of their founder, daily prayer and personal service to the poor. That same Vincentian spirit characterizes the association today. It asks the personal gift of self, of time, devotion, sacrifices, and perseverance in the effort to bring dignity to each person and to respond with compassion to every human misery. In 1857, at St. Vincent de Paul Parish in south St. Louis, Catherine Harkins extended the work of St. Vincent to the United States. The number of associations grew and in 1960 a national organization was established to offer consistent formation to all associations and to strengthen the bonds of charity. There are 250,000 Ladies of Charity serving people who are less fortunate in 52 countries. In the United States, 8,000 Ladies serve in 68 associations in 21 states and the District of Columbia. 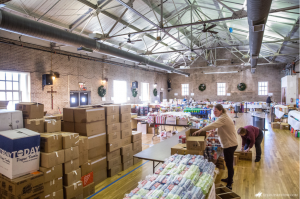 Inside the spacious hall at St. Vincent de Paul Parish in south St. Louis, several women were busy sorting items and checking distribution plans for an annual Christmas gift-giving to residents of a nearby senior residence. It’s part of the Christmas program, the biggest operation of the year for the parish known for its ministry to poor and homeless people. But even on a typical weekday, members of the Ladies of Charity take part in a half-dozen or so other activities related to the parish outreach. Their goal is “to serve rather than to be served.” This year, the Ladies of Charity celebrated the 400th anniversary of its founding in France. On Dec. 8 this year, the group at St. Vincent de Paul Parish in south St. Louis dedicated a plaque presented to them by the national organization recognizing their association’s role in the Ladies of Charity history. Catherine Harkins began the outreach at the parish in 1857, the first association of the Ladies of Charity in the United States. A member of St. Vincent Parish, she had three nightly visions of St. Vincent trekking through the snow to gather needy children under his cloak. She shared her experiences with Vincentian priests who served the parish. Father Urban Gagnepain saw it as a sign for her to assemble a group of women to assist impoverished people. On Dec. 8 of that year, Harkins gathered 11 other women and formed the association. The group began by helping people who were starving due to an economic depression caused by the panic of 1857. Their outreach widened to support orphans, senior citizens and destitute families. Today, in the Archdiocese of St. Louis, associations are at St. Vincent Parish in south St. Louis, St. Vincent de Paul Parish in Perryville, St. Catherine Laboure Parish in Sappington and at the Ladies of Charity Service Center in St. Ann (formerly known as Caritas Center), which has a food pantry and thrift store. Women needn’t be a member of one of the three parishes to join the Ladies of Charity. Joan Stanard, president of the Ladies of Charity at the south St. Louis parish, served six years on the national board. She has been a member since 1999, when she retired and a friend, Judy Sieckhaus, invited her to become involved in the volunteer work. Stanard’s ties to St. Vincent go back to when she was 4 years old and attended Guardian Angel nursery school, which was operated nearby by the Daughters of Charity, and visited her grandmother, who belonged to the parish. Stanard is proud that the Ladies of Charity in the United States began at her parish. She’s excited about a new home health care program being started by the Ladies of Charity USA that will provide the workers with dignity as co-owners and with job training. Another important new effort is a fair-trade initiative called mission market. Pat Monroe also was invited to join the Ladies of Charity by Sieckhaus, becoming involved in 2010. “I started out gradually, and now it seems like I live here,” Monroe said with a laugh. Besides the outreach work, the Ladies of Charity at St. Vincent gather each fall for a day of recollection and have a May Crowning at the Daughters of Charity provincial house. Originally published along with photos in the St. Louis Review.